Back in 2000, I was living in London on a fellowship to study electronic music. I was lucky to catch a performance by one of my favorite musicians, the elusive Aphex Twin. I had read that Aphex Twin would “ring out” each venue before performing in it, testing out sounds to find the resonant frequencies of the room (which are also the frequencies most likely to feed back). That night, I had a memorable experience of sound as massage. As Aphex Twin blasted his otherworldly beats, I felt just my nose vibrating at one point, then just my chest, and then just my skull. Whether intentional by the DJ or not, the resonant frequencies of various parts of my anatomy were being activated by the music. Our perception of sound is a specialized form of touch. From the tiny fluctuations of hair cells (stereocilia) in our inner ears to the vibrations in our chest at a bassy club, sound literally moves us. When used carefully, this sonic movement can be a massage that reaches down to the cellular and molecular levels. According to the Mayo Clinic, “Massage is a general term for pressing, rubbing and manipulating your skin, muscles, tendons and ligaments…Studies of the benefits of massage demonstrate that it is an effective treatment for reducing stress, pain and muscle tension.” Sound (the passing on of vibrational data at the moment of collision between any two atoms or molecules) can also manipulate these areas of the body, but on a more subtle level. Every object has its own resonant frequencies: natural frequencies of vibration determined by the physical parameters of the vibrating object. Neuroscientist Seth Horowitz cites a study finding the strongest resonance of a (living) human head at about 200Hz, approximately the note G3 (personally, I find that humming between 175-230Hz to feel most resonant in my own head). 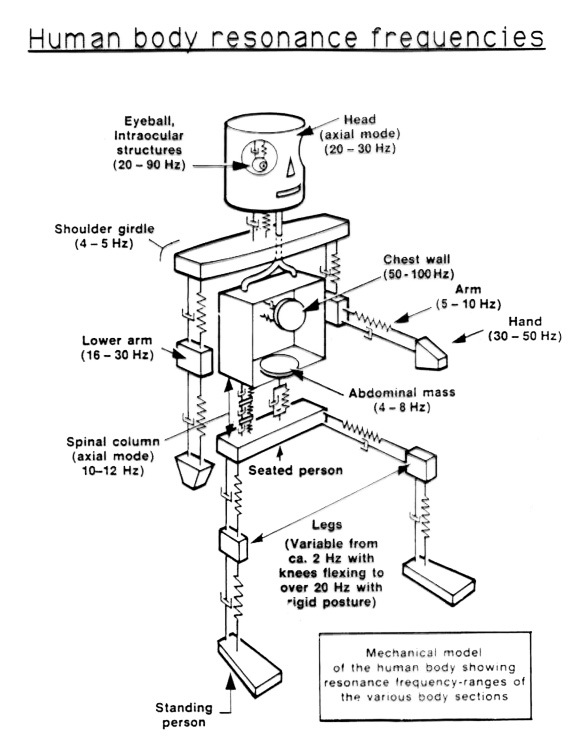 The following diagram was created in 1998 by Sven-Olof Emanuelsson to show the various mechanical resonances in the human body. Note the wide range of frequencies in many areas, and the lack of organic forms in the illustration. As a bass guitarist, I especially love the sensation of low frequencies. Providing the experience of a huge subwoofer without the potential hearing damage, the SubPac vest is a “tactile bass system.” With frequencies so low that they can only be felt in the body (down to 5 Hz), this is a visceral experience of music transmitted directly through the skin. Similarly, large metal Himalayan bowls can be placed on the back or abdomen of a prone or supine body. When resonated, the deep and complex overtones of the bowls travel right through skin, bones, muscles, and organs. Vibroacoustic sound beds and monochord tables offer other flavors of full-body tactile musical experiences. Many musicians are used to this kind of feeling: an acoustic guitar, cello, or saxophone transmit their vibrations via the direct somatic connection back to the player. The targeted use of ultrasound (frequencies higher than 20kHz) can also be beneficial. Since the 1980s, it has been used to break up kidney stones. More recently, ultrasound has been used to battle cancer cells. Weighted tuning forks have the capacity to transmit sound via bone conduction, providing an internal listening experience and targeted sonic massage. A 2002 study found that weighted tuning forks can release the molecule nitric oxide in cells, a relaxation response which enhances vascular flow. Perhaps the simplest and most accessible form of sonic massage is the use of the voice. Through humming and toning (relaxed, open vowel sounds), the body can be resonated from the inside out. A famous story of the French ear specialist Dr. Alfred Tomatis describes his study of some Benedictine monks. After spending six to eight hours chanting every day, a new abbot changed their schedule and removed the chanting. The monks become lethargic and tired, even though they were getting more sleep. Dr. Tomatis reintroduced the chanting, and soon they were back to their original energy levels. A simple, daily vocal practice can have a strong effect on our well-being.